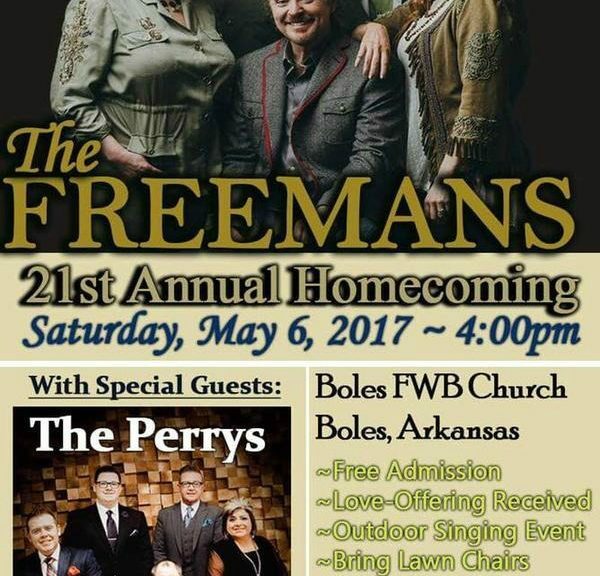 NASHVILLE, Tenn. – (March 30, 2017) – Multi-award winning family group The Freemans are excited to announce details about their 21st Annual Homecoming concert. 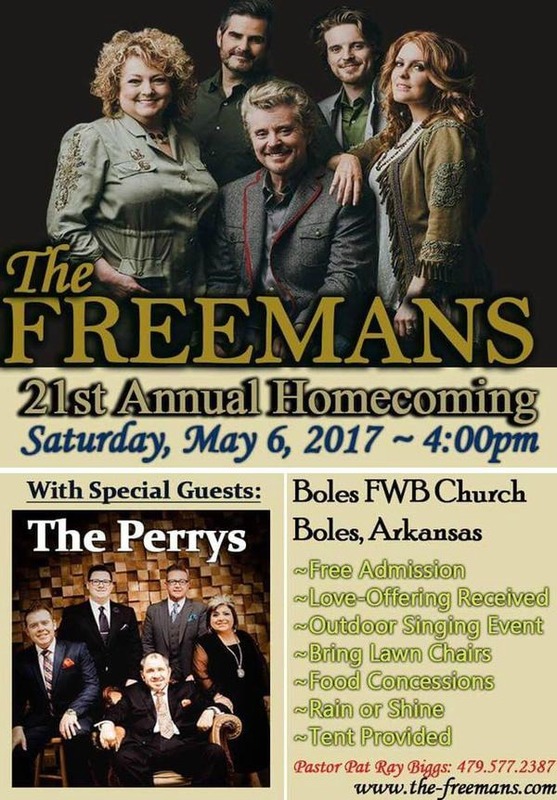 This year’s homecoming event will take place at Boles Free Will Baptist Church in Boles, Arkansas on Saturday, May 6, 2017. In addition to fans enjoying the sounds of this unforgettable family, The Freemans are proud to share the stage with Dove Award nominated mixed group The Perrys. As in years past, this event will be free admission with a love offering received to help cover expenses. The concert will begin promptly at 4:00 p.m. The Freemans current single “It Still Takes The Blood” is already impacting radio coming in at #5 on the top 10 new releases for May 2017. For more information on the event, visit www.the-freemans.com . Group matriarch Chris Freeman has started the year out with three nominations in the upcoming Absolutely Gospel Music Awards. Chris’ first ever solo recording, The Hinson Side of Me, earned her nominations in the Female Vocalist of the Year, Country Recording of the Year, and Special Event Project of the Year categories. Chris will be a featured performer at the 2017 Absolutely Gospel Music Awards Celebration in Nashville, Tennessee on Tuesday evening, April 11, 2017. To learn more about The Freemans go to http://www.the-freemans.com . Follow them on FaceBook at https://www.facebook.com/thefreemans or Twitter at https://twitter.com/thefreemansfans . To book the Freemans contact The Freemans, PO Box 2514, Hendersonville, TN 37077. Booking in-house – Chris or Darrell Freeman, Office 615-824-6161 – Text 615-390-6486 or E-mail bookingthefreemans@gmail.com . History, experience and spiritual wisdom are three attributes that can be used to describe the foundation of the Freeman ministry. Deeply rooted with family, the Freemans experience spans 30+ years. From Darrell’s entrance at age 16 with his family’s group, the Pathways, to Chris’s award-winning teenage years with the Hinsons, the Freemans know the ins and outs of Southern Gospel music. No doubt, Chris’s unique sound is the reason she was the youngest female artist ever to receive the coveted “Queen of Gospel Music” award two years in a row (’76, ’77) as voted by the readers of Singing News Magazine. In 1980, the lives of Darrell and Chris Freeman became one when they married on August 2nd. After singing with the Pathways for three years Darrell and Chris headed for Nashville and began the Freemans. Joe Freeman, Darrell’s cousin, soon joined. them as the third part harmony, as well as their keyboard player. 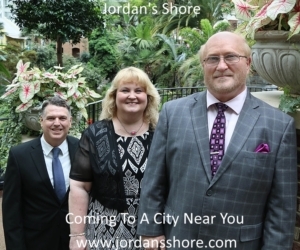 With this sound they have garnered tremendous growth and success. In 1997, Darrell and Chris’s daughter, Misty, began playing acoustic guitar with the group on stage. Then in 1998, she began singing with them when they recorded Standing Out. Also on stage is Caylon Freeman, Darrell and Chris’s youngest child. He decided to join his family on the road full-time in 2002. He is now playing the drums and singing some with the group. Now in their 20th year, the Freemans, still do approximately 250 dates a year, and continue to experience tremendous success.